Water gardens which are installed in the northern hemisphere must be properly winterized each year. Water garden winterization is a process that requires experience, knowledge and patience, and below are some tips that those new to this hobby will find to be invaluable. What Is Winterization And Why Is It Necessary? Winterization involves the steps needed to prepare your pond or water garden for cold weather. Cold temperatures can wreak havoc on ponds and water gardens which aren’t prepared for them. The primary purpose of winterization is to prevent the roots of the plants from freezing; this will result in the death of the plant. Any fish that are present won’t be harmed by the cold weather itself as the surface of the pond will freeze over but they will be lower in the warmer area. Leaves are a big problem during fall and winter and are something that every pond owner will have to deal with, especially if there are trees nearby. If leaves are allowed to fall in the water and accumulate they will decay which will cause the water to become dirty and unhealthy. This is why those who are experienced with water gardens always cover them with netting at the beginning of fall to ensure that they catch any falling leaves. Preparing your water garden for winter will make it easier to manage during spring and will maintain its quality for many years to come. November is the ideal month to begin the winterization process. This is when frost will first begin appearing, and you should cease feeding and fertilizing your plants before that. You will notice that the vegetative growth of your water garden will be reduced, and leaves will turn from green to brown and yellow. Plants must be removed from the water garden and placed indoors before the cold weather sets in or they will transform into green mush. Floating and tropical plants should be removed first, followed by the aquatic plants as they tend to be more resilient. Once tropical plants are taken inside they can either be placed in a container or thrown away, but what you don’t want is for them to sink to the pond’s bottom. Should this happen, the plants will die and decay which will reduce the health of the water garden. Lilies are best stored in the form of tubers or roots while the toughest plants can be left outside. Species such as anacharis can be placed in the lower levels of the water garden which will protect them from the cold. Some plants are better at handling cold than others, and if your water garden is like most there is a good chance you have a large variety of them. It is important to familiarize yourself with the plants you own and which can be left outside longer and which ones require special needs. Any tropical or subtropical plants must be tended to earliest. 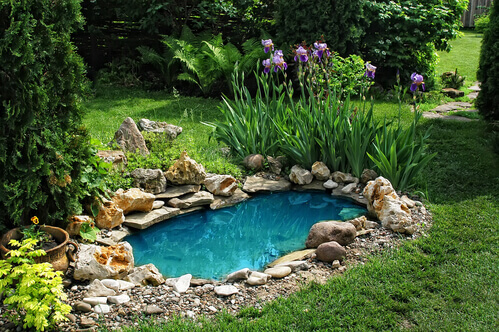 If you think that you are not familiar with pond winterization, or simply lack the time to do so, you should give us a call at Fitz’s Fish Ponds. Our winterization services are efficient and affordable, helping you enjoy a beautiful pond or water garden when spring comes.